Yeah, I know I said we'd take a day off today, but this afternoon we got to messing around with the forms and soon they popped off, and then we had an intense discussion of how the shed would attach to the foundation, and soon we were taking the pieces out of their boxes and starting to put the modules together. Anyway. 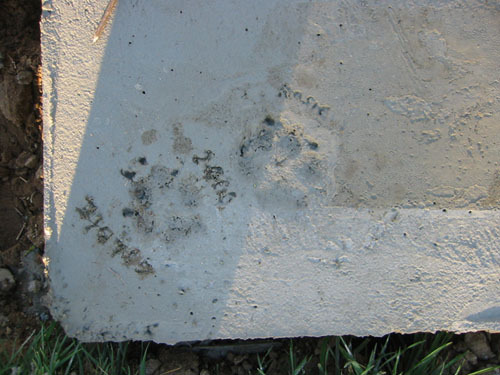 Here's our little paw-print stamp on the concrete. The dogs enjoyed walking in the concrete, but did not care for being held in place and having a paw-print taken. With the forms pulled off. In theory, this concrete mix can be walked on in 24 hours, which was technically true, although the surface was still a little soft. We went around and filled in soil to about two inches below the surface. In the back, the soil was much higher than the slab, so we dug it down and spread that around the lower sides. Here's Noel, assembling parts of the base of the shed. Off behind the camera, I sorted the parts out by number (they are stamped, which is much nicer than your average kit or, say, the concrete mixer). Prefab metal buildings are usually constructed by putting together a series of modules and then assembling the whole thing. When you get to the assembly part, you need to get it done in one go, because it's got no structural capacity until it is finished. But you can pre-assemble the modules to make the final assembly go faster. It's pretty easy to follow the instructions, and the pieces are decently well-made, so the plan is for Noel to work on assembling the various parts this week, then we'll erect the shed together on Friday, when we both have the day off, so we can move things into it next weekend. I'm always amazed by the amount and quality of the work you guys do. How did you learn? Any tips for a new homeowner interested in becoming more handy? 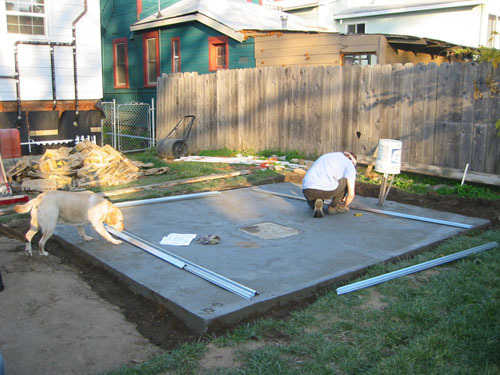 It seems like the only way to really learn some things (like basic wiring, or pouring concrete) is to do it, but I'd hate to end up with a big chunk of bad concrete in my yard or shorts in the wall. To be honest, most of our information on construction comes from books, either ones we've bought or ones we've found at the library. When I'm away at school I spend my spare time reading through the construction section in the library to learn stuff. We also spent a few years almost obsessively watching This Old House and other home-improvement shows. But a lot of it is just reading and understanding and taking it on faith that we will be able to do it right. We often spend a lot of time researching the project before starting work. 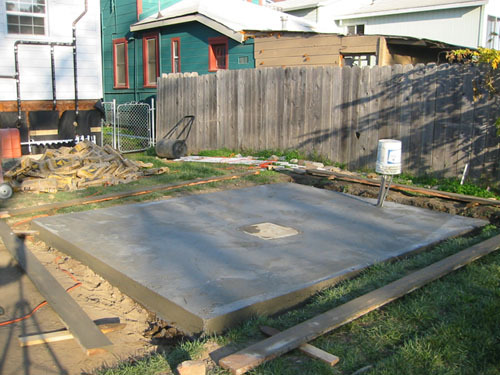 For the concrete slab, we spend a couple of months reading about slab foundations, which is really a lot more than most people would think was necessary. Also, some skills we just don't have. One thing you don't see here is that we kind of made a mess of the surface finishing. When I compare my finishing work to what Counterforce did, it's pretty bad. 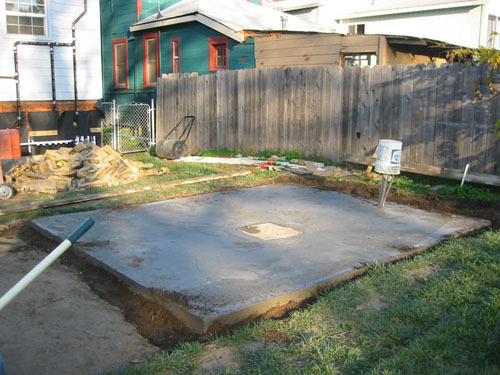 But we're willing to accept some crappy work on a shed/greenhouse floor, and the next time we do concrete work we will have more practise. For the electrical work, Noel already had some experience with electrical work and wiring, so it was mostly a matter of getting a book and learning the codes. For plumbing, we decided to hire a plumber for anything involving raw sewage or gas, because the mistakes are much more violent and smelly.